Wait, most houses are how old?! 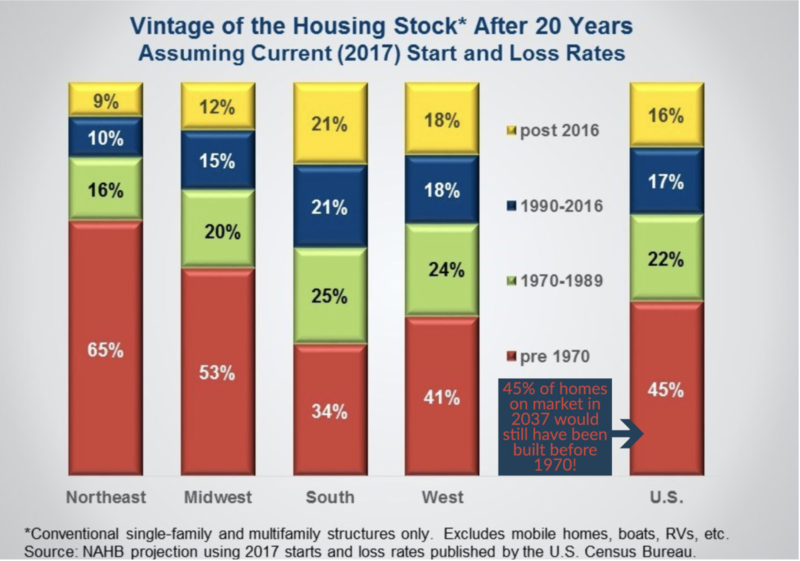 Check out this craziness from the National Association Of Home Builders (NAHB): most of the houses out there in the U.S. are old and decrepit, and builders haven’t been putting up enough new houses to replace them. Housing supply works sort of like populations. Starting construction on new homes is like birth rates, it needs to outpace the rate at which houses are demolished or otherwise taken out of commission (housing death rates). The NAHB numbers show a huge homebuilding slowdown the past 13 years, which has forced old homes to stay on the market longer (no wonder remodeling is a $350 billion/year industry!). My home of Detroit is a case in point: we had a huge housing boom in the 50’s and 60’s as people flocked in to grab stable auto industry jobs that could support home ownership, but now a lot of the housing here is way old. And this isn’t just here, it’s nationwide. NAHB predicts 45% of homes on the market in 2037 would still have been built before 1970! If you want to make the leap to home ownership in the next few years like me, should we be worried? Even though I’m learning affordability isn’t as big a hurdle as I thought, what if your or I get stuck with an older house that’s a money pit? Remodeling and home maintenance work is expensive, so even if we can make my debt-to-income ratio work for a home, would we have to choose between quality of life and having spare cash if we dive into home ownership with an older home? Something I’m learning about home ownership is that it’s not a one-and-done deal. You could go for a starter home and finance it with a much-lower-cost ARM and let that play before trading up when construction accelerates in the coming years. Or depending on where you are on your income trajectory, you can finance a starter home with a longer-term loan knowing that your income will grow and you’d keep that home as a rental when you trade up later. Millions of us are in a similar situation, and builders should see the massive opportunity here—otherwise, money we could be paying them will go to Home Depot to pay for renovations for our ancient houses.